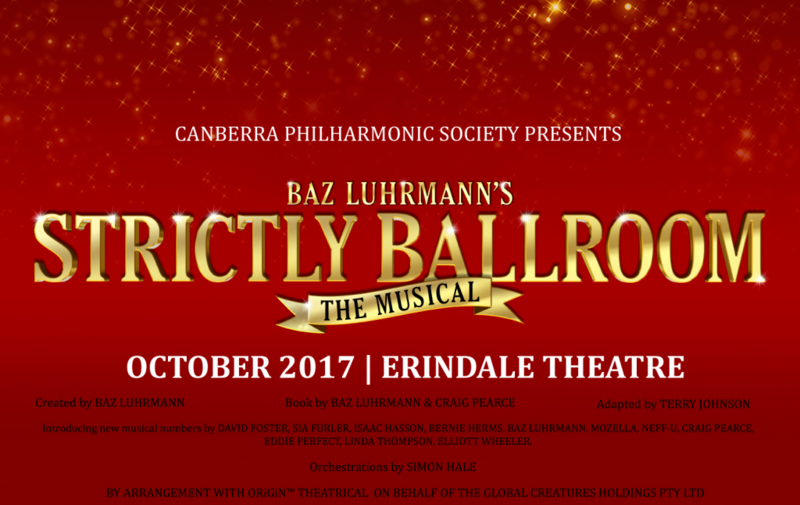 We're excited to announce our October 2017 production will be Baz Luhrmann's STRICTLY BALLROOM THE MUSICAL! FEATURING SONGS FROM THE 1992 HIT FILM including "Love is in the Air", "Perhaps, Perhaps, Perhaps" and "Time After Time", as well as new songs from internationally acclaimed artists and composers such as Sia, David Foster and Eddie Perfect. Originally from New Zealand and based in Melbourne for nearly 25 years, Chris arrived in Canberra earlier this year and is currently directing A View From The Bridge for Canberra Repertory. He is the founder and Artistic Director of Mockingbird Theatre and a director of over sixty productions in Australia and in NZ. He directed the acclaimed production of The Laramie Project at Chapel off Chapel, which won the Victorian Green Room Award for Best Independent Production, Melbourne theatre’s highest honour. Chris received critical praise for his productions of the Victorian tour of Black Diva Power: Nina Simone & Billy Holiday starring Ruth Rogers-Wright, Love! Valour! Compassion! for the Midsumma Festival, The Dining Room at the Victorian Artists Society, Burning for Mad As Us and starring two-time Logie winner Libby Tanner, the Australian premiere of Shining City for Hoy Polloy and Foreign Bodies for Sly Rat. Other acclaimed and award-winning productions include The Grapes of Wrath, Cloudstreet, One Man Two Guvnors, Twelve Angry Men, One Flew Over The Cuckoo’s Nest, The Nance (Australian premiere), 33 Variations (Australian premiere), Compleat Female Stage Beauty, Three Days of Rain, The Rise and Fall of Little Voice, Master Class, Amadeus, Blood Brothers, Of Mice and Men, Shirley Valentine and Under Milk Wood. He has also directed many musicals and concerts including Chicago, the NZ revival of Hair, A Funny Thing Happened On The Way To The Forum, Mame and the hugely successful Melbourne premiere of A Slice Of Saturday Night. Emma has been dancing for more than 30 years. When she was convinced to try musical theatre more than 15 years ago, she was instantly hooked and has gone on to perform in and choreograph a variety of shows, and even turned her hand to directing Supa's Eurobeat - Almost Eurovision. Emma recently choreographed Philo's critically acclaimed production of Anything Goes, and danced in Philo's productions of Rock of Ages and Cabaret. Since moving to Canberra from Adelaide six year ago, Rhys has played a part in various Canberra music theatre productions, as a cast member, repetiteur, and music director. Rhys has music directed Philo's productions of Pirates of Penzance and Cabaret, and Phoenix Players’ production of Next to Normal. Outside of theatre, Rhys works as a technology consultant with Accenture, and enjoys tennis, running, and paddleboarding. AUDITIONS will be held on the weekend of May 20-21. More details and booking form available here.